We talk a lot about the causes of mold here at Letsremovemold.com, with a keen focus on reducing indoor moisture levels which in turn reduce the overall level of internal relative humidity. But how are you supposed to know whether your humidity levels are normal or bordering on that of a tropical rainforest? A fair question, and one we are going to answer in this guide. 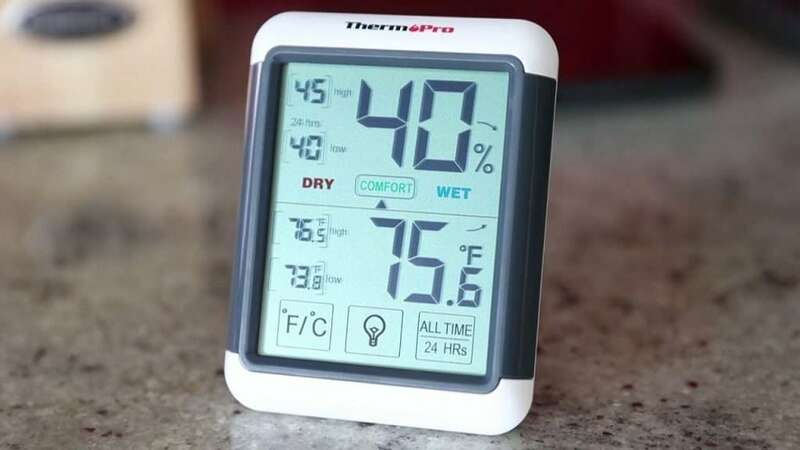 The most accessible and cost-effective way to ascertain both the ambient temperature and the levels of humidity within your home or any other building is through the purchase of a hygrometer. Despite the technical sounding name, hygrometers are actually very simple in nature and require no setup or technical know-how to get them working and accurately reporting the information that you need to know. There are several different types of hygrometer which serve the purpose of measuring relative humidity. Each comes with their own pros and cons but if you’re looking for simplicity, the digital hygrometer is the perfect choice. Digital hygrometers come in a variety of shapes and sizes and feature a myriad of features, but the two most important for homeowners are of course internal temperature and relative humidity. Most digital hygrometers will only require you to insert a battery before turning the device on where it will then immediately begin monitoring and reporting on the ambient conditions within your home. The mason hygrometer utilizes older technology to measure levels of indoor humidity. What you will see is two thermometers mounted onto a scale; one reporting the dry bulb temperature and the other the wet bulb temperature. These two pieces of information can then be analysed to ascertain the current levels of humidity. Also known as a psychrometer, the whirling hygrometer also takes a somewhat rudimentary approach to calculating relative humidity. Simply hold the handle and spin the device so that it rotates - and in doing so - it will provide a reading on the current levels of humidity. Whirling hygrometers are available in several different designs and can be customized to user requirements, providing a significant amount of flexibility if a specific usage profile is required. Once you have been presented with a reading, you will now be able to regularly monitor your indoor environment to gain an idea of the internal conditions present over a period of time. Your reading will be expressed as a percentage, with a number of anywhere between 0% – 100%. A reading of less than 40% RH suggests that the air within your indoor environment is dry, with very little chance of mold being able to form due to excessive moisture. But such a low reading also brings with it several disadvantages, with the most noticeable being a feeling of discomfort due to the air that you breath lacking moisture. If it is summer, a RH of 30% isn’t unusual for many buildings. An RH reading within this range is deemed to be desirable, both in terms of your own personal levels of comfort as well as being an environment in which mold will struggle to grow. Specifically, a figure of around 50% is near perfect for most households and will provide the optimum levels of comfort. Once your hygrometer presents you with a reading that surpasses 60% RH, you are officially entering the realms of high humidity. You will notice a difference in that the air will feel more humid, and depending on the temperature, you may find yourself sweating or uncomfortable. This is one reason why many homeowners decide to use a bathroom dehumidifier in conjunction with their extractor fan. In addition, you will find that mold becomes a serious problem the further over 60% RH you progress, with mold forming on surfaces such as your sofa and on the clothes within your closet. As mentioned, extremes of relative humidity - whether too low or too high – can be problematic from a health point of view. The most significant health complaint is related to the respiratory system where high humidity can provoke asthmas attacks. And as the level of mold spores in the atmosphere will be greater, these too will circulate in the air which can pose a problem for those with weak immune systems. Low humidity on the other hand can cause dry throats and itchy skin and eyes, none of which are pleasant in addition to increased risk from asthma attacks. In addition, germs and viruses thrive in low moisture environments. High humidity is the enemy of every item of furniture in your home as well as any other possessions that are present. High humidity will cause mold, fungi and algae to grow in your bathroom, kitchen and even your bedroom and living room, resulting in damaged furniture and an unpleasant indoor environment. Musical instruments that are constructed from wood are particularly susceptible and should be protected to avoid damage to the wood itself. 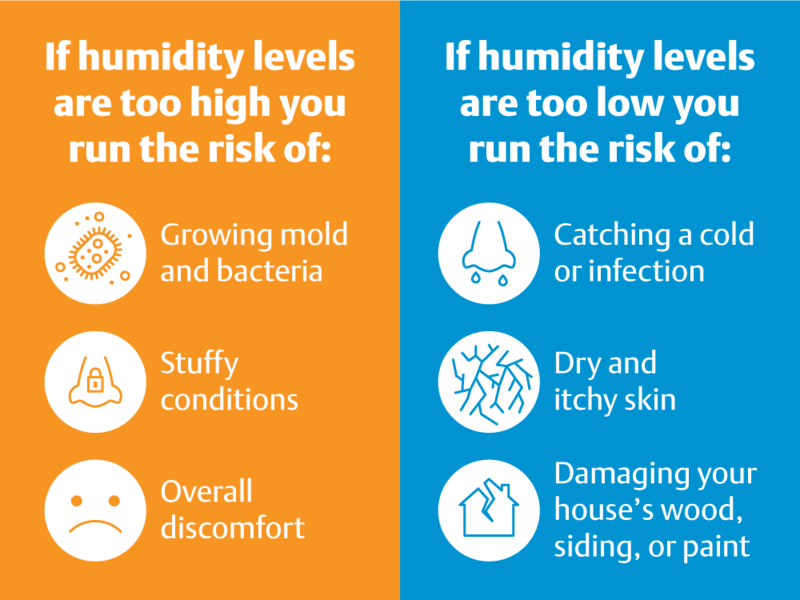 Once you have established the humidity levels for your home or office, you can then take steps to increase or reduce this level as required until the desired humidity range is reached. Increasing the level of relative humidity can be done by purchasing a humidifier which is designed to increase the moisture content of the air within any indoor environment. It is possible to decrease the levels of humidity in one of several ways. The first is by improving ventilation, either by opening windows and doors or through the use of an extractor fan. The second option is to purchase a dehumidifier which is designed to extract moisture from the air, thus lowering the humidity of the environment in which it is running. Monitoring the humidity levels within your home is one of the single most important things that you can do to protect yourself, your family and your possessions. And with the help of a simple hygrometer, this process couldn’t be easier.